Beautifully engraved RARE certificate from the Lennen & Newell, Inc issued in 1952. This historic document was printed by Hassbrouck Thistle & Co and has an ornate border around it with the company's name on top center. This item is hand signed by the Company's President and Co-Founder (H. W. Newell ) and Secretary, J.J. Speirs and is over 53 years old. 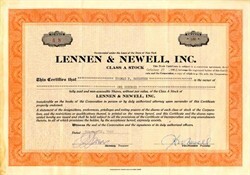 Lennen & Newell, Inc. was a famous large advertising agency that went out of business in the early 1972. The company was founded by H. W. Newell , Phillip W. Lenned and Adolph J. Toijo.